In the latest deluge in a summer that has seen China's worst seasonal flooding in a decade, heavy rains over the weekend have caused the Bailong River to burst its banks, creating flooding and subsequent mudslides that have devastated towns in northwestern China. 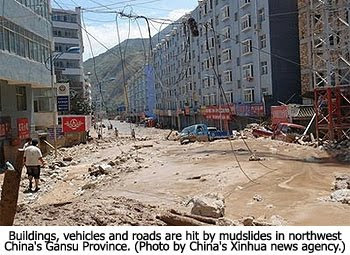 Flotsam has blocked the river creating a tidal wave of mud, rocks and water which crashed down on the Gansu Province, ripping houses from their foundations and tearing six-story apartment buildings in half. Houses are slogged in mud, cars are encased in debris, and streets are buckled beyond use. To make it even worse, emergency response has been hampered by the mountainous location. The loss in human life has been tragic as an estimated 1,300 Chinese are still missing. Nearly 45,000 people have been evacuated. This latest flood in China has confirmed 127 more dead to an already 1,100 people this year killed by the floods. The damage across 28 provinces and regions will cost an estimated tens of billions of dollars to repair. Nearly four million Pakistanis faced food shortages and starvation from the destruction of their 1.4 million acres of crops in the breadbasket of Pakistan due to their country's worst-ever flooding in their recorded history. The swollen Indus River's overflow submerged the Mor Khan Jatoi village with chest-high water and destroyed many of its 1,500 mud homes. Resulting landslides buried two villages in the northern Gilgit-Baltistan. In Pakistan, more than 1,500 people have been reported killed and millions more left begging for rescue aid as they face down starvation. In Indian controlled Kashmir, rescuers raced to find 500 people still missing in flash floods that have already killed 132. Flash flooding has sent massive mudslides down remote desert mountainsides. Homes were buried and power and telecommunication towers were toppled. High waters have destroyed thousands of homes and damaged crops, submerging 36,700 acres of farmland. An estimated 5,500 homes were destroyed after the recent heavy rains. While the nations to the south report terrible flooding, Russia to the north faces a trial by fire. 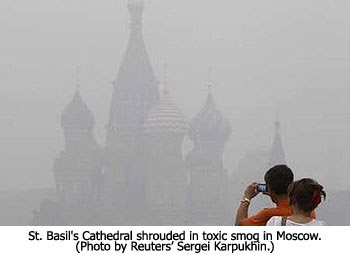 "Moscow deaths double amid smog to 700 people a day," reports the Associated Press in their Monday, August 9 article by Vladimir Isachenkov. Western Russia has been burning as a sweltering heat wave — the most intense heat wave in 130 years of record keeping and 1,000 years of historical documentation — has ignited 550 separate wildfires. Nearly 10,000 firefighters are battling the blazes with little success in putting them out. Heat and fire have annihilated 20 percent of Russia's wheat crop. The Russian capital of Moscow is engulfed by poisonous smog from 40 local wildfires. For six straight days an acrid smog has blanketed Moscow, leaving residents choking on high concentrations of carbon monoxide and other poisonous substances. Moscow's health chief Andrei Seltsovky claims the city morgues are nearly overflowing with 1,300 bodies, close to their capacity. The people must make a difficult choice to either breath the noxious fumes or close their windows and swelter to death. The wildfires have directly caused the demise of at least 52 people and destroyed nearly 2,000 homes. The world continues to painfully witness what NaturalNews.com reported in their article "Natural Disasters Up More Than 400 Percent in Two Decades" (Thurs., Jun. 5, 2008, David Gutierrez) — natural disasters are increasing in frequency, ravaging the world, our countries, and even our own homes. "The number of natural disasters around the world has increased by more than four times in the last 20 years, according to a report released by the British charity Oxfam. Oxfam analyzed data from the Red Cross, United Nations and researchers at Louvain University in Belgium. It found that the earth is currently experiencing approximately 500 natural disasters per year, compared with 120 per year in the early 1980s. The number of weather-related disasters in 2006 was 240, compared with 60 in 1980... Between 1985 and 1994, Oxfam found that 174 million people were affected by disasters each year. In the following decade, this figure increased by 70 percent to 254 million people per year." The Bible gives us the correct answer to all this weather upheaval — God is speaking to us. God has always spoken through signs of nature. The Bible provides us with many signs we are to watch for that will signal the soon return of Jesus, including natural disasters. Jesus said these signs would be like "birth pangs" (Matt. 24:8). That means they will increase in frequency and intensity the closer we get to the Lord's return. And that is exactly what appears to be happening today. God uses signs of nature to underline the importance of major events, like Jesus' soon return. God also uses them as remedial judgments to call nations to repentance. God isn't blind to the massacre of Christians in China where members of the underground church are routinely rounded up and sent to detention camps, to Pakistan where Christians are falsely charged of blasphemy to Allah and brutally executed daily, to India which burns Christian orphanages to the ground, to North Korea which enslaves their population to poverty at the whims of a madman, and to Russia who arms Iran in its ambitions to destroy Israel. Because of our rejection of God and His moral standards, we tragically are the ones truly responsible for these natural disasters. As long as the nations continue to reject God and persecute believers in Christ, He will use natural disasters to yell — "I love you! Repent and come back to me!" God's Word makes it clear that when He sends discipline, the fundamental purpose is never to punish. Instead, the purpose is to call us to repentance so that we might be saved. Here's how the prophet Isaiah expressed it: "When your judgments come upon the earth, the people of the world learn righteousness" (Isa. 26:9b). Our God is so merciful. He is patiently sending us one natural disaster wake-up call after another because He never pours out His wrath without warning. And the greatest "coming wrath" already visible on the far horizon is the 7-year Tribulation (1 Thes. 1:10), which will include so much natural devastation that the oceans and lakes will run red, the atmosphere will be polluted most likely by radiation, and a third of the grasses and trees will be decimated. And so, we each individually need to repent for our own rebellion and selfishness. Across the globe we need to repent for removing God from our societies, for our murders from the womb to the elderly, for our obsession with sexual promiscuity, for our preoccupation with self, and for our lack of support for Israel's right to exist. We need to accept Jesus as our Savior, the only way we will be rescued from the "coming wrath." When Jesus finally returns, the curse will be lifted and the natural calamities will cease. Note: If you would like to join Lamb & Lion Ministries in contributing to the relief efforts in Pakistan, we are raising funds for food and aid which will be distributed by Pastor Nazir Gill of Christian Life Ministries. Please donate to the Pakistan Relief Fund today! Also, continue in prayer that the relief efforts will greatly spread the hope of Jesus Christ to those areas in Pakistan where the Gospel has yet to be shared. "Russia's worst droughts in a century have destroyed almost 10 million hectares (25 million acres) of crops in central and European areas, authorities said. 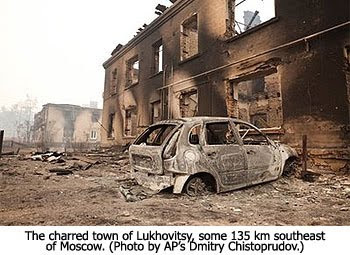 A state of emergency has been declared in 18 Russian provinces, where fire has engulfed more than 26,000 hectares (64,000 acres) of forest." What if it should be, that after a quick and decisive Ps.83, Israel suddenly turns the vast waste-lands of the recovered Abrahamic Covenant into a near-restored Garden of Eden, so productive that becomes the envy of ... Gog ...? - There are more and more "spoils" to pick from for ole Gog...."
- and now, as you say - food. Maybe it is all of the above (?). " "Khalidi and other Obama associates are members of an American effort to raise $370,000 to finance the purchase of a U.S. ship in an effort to break the Israeli naval blockade of Gaza. The tentative name of the ship is "The Audacity of Hope," after Obama's autobiography. " Keep looking up. Can you hear the "Footsteps"? gurumph! Mines gone walkabout in the blinkin bushes. Excellent information - all in one place. I had to share with everyone I know! Last number I heard from the Pakistan flooding is 6 million affected. Relief organizations consider this to be bigger than the Haiti earthquake, the 2005 tsunami, and the previous Pakistani flooding...combined. Like with Haiti, isn't it amazing how God uses natural disasters and rumors of war to open doors for the Gospel that were once closed shut? Today I read in Christianity Today that many Christians have substituted abortion and homosexuality for greed as the root of all evil. Has Lamb & Lion Ministries jumped on this bandwagon? John, self-centeredness is the root of our sinful behavior. Thank you for the $2,000 raised for the Pakistan flood victims. Want to see where the relief efforts went, check out Pastor Gill's YouTube videos 1 and 2. With the relief came the opportunity to share the Gospel in this unique opportunity. Praise the Lord! wishes in the name of the lord.